The Buffalo Sabres have been playing better defense as of late. Not only are the number of goals allowed by Buffalo decreasing, their opponent shot totals are going down as well. 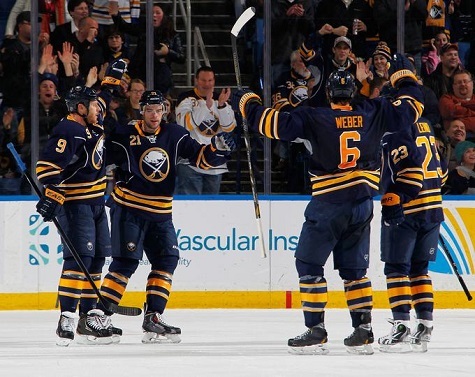 The Sabres only allowed 2 goals and outshot the Winnipeg Jets 31-27 enroute to a 4-2 victory. Buffalo came out firing in the 1st period as they took 19 shots on net. Jets goalie Ondrej Pavalec was on his game and turned away all 1st period shots. Sabres goaltender Ryan Miller came up huge as Chris Thorburn had a break-away but Miller turned it aside. The Sabres started the 2nd period rather poorly. It looked like it was going to be one of those nights for Sabres fans. The Jets got 2 goals from Mark Scheifele, which were 36 seconds apart. On the first goal, Scheifele deked out some Sabres defenders and beat Miller. The second goal, Scheifele sent the puck on net of a partially screened Miller and made it 2-0 just like that. Buffalo did a great job keeping the puck in the zone for their first goal. Both Steve Ott and Mike Weber were able to keep the puck in the Winnipeg zone. Steve Ott eventually fired a shot and beat Pavalec to make it 2-1. It was all Sabres in the 3rd period. Cody Hodgson entered the Jets zone and fired on net. Marcus Foligno was there to tip in the rebound to tie at 2-2. A Eric O’ Dell hooking penalty allowed Buffalo to go on the power-play. Almost 90 seconds after the Foligno goal, Matt Moulson would tip-in a Christian Ehrhoff shot to take the lead 3-2. Matt Ellis provided an extra-insurance goal with a few minutes left in the 3rd period. Buffalo hadn’t won a game in regulation since Nov 15th when they defeated the Toronto Maple Leafs 3-1. 12 different players recorded a point for the Sabres. Matt Ellis is having a great week. Not only did he score against the Jets, he had the game-clinching goal for the Rochester Americans in their Outdoor game last week. Buffalo held the advantage in faceoffs 30-18. Buffalo next plays at home vs. the Boston Bruins on Thursday.